I knew my life would not be the same again when I saw the e-mail from Anne Baekkalund, Diageo’s efficient secretary. It was an invitation to be a part of Diageo’s annual event-The Classic Malt Cruise. I had been yearning to take part in this event for a long time and when the opportunity did come, it came in style. To be part of the event as a guest of Diageo simply means that you have arrived on the whisky scene! Diageo has been conducting this event for over a decade and it has been huge success since its inception. At one time more than 200 boats participated in the event but due to logistics and efficiency issues; Diageo limited the participants to about 100 boats for the last couple of years. The boats converge at Oban from all corners of the world, but Diageo’s special guests (about a dozen and half) are invited into three splendid vessels- the speedy Grampus, the magnificent grand old lady Eda Frandsen and the classy French boat Chantilly. For the next 6 days it is sailing combined with fun and frolic and tasting of some of Diageo’s exclusive malts. During the week, each boat takes its own course but meets for the pre-set events at the Classic Malt Distilleries in Lagavulin, Caol Ila, Port Ellen and finally at Talisker in the Isle of Skye. Actually, the festivities start the day before the sailing-off day at the distillery at Oban. After the initial introductions, we, the special guests were welcomed by a rotund Chinese looking gentleman who quickly whisked us away from the increasing crowd for a private tour of the distillery. “I am Kenny Gray, working in Diageo for 39 years and as Distillery Manager for last 4 years in Oban,” he introduced himself. Oban is really a small distillery and if the jetting out chimney of the distillery is not observed, nobody actually would believe that there exists a working whisky distillery. It is surrounded by shops in the front and the famous McCaig’s hill in the rear. “Oban is marketed only as a Single Malt and never really ends up in any blend that I know of,” states Kenny, beginning the distillery tour. As expected from a small distillery, it has only one mashtun and the two stills are very small, much like those at Edradour. The malted barley which comes from Roseisle is peated not more than 1-2 ppm and only distiller’s yeast is added to break the sugars from the malted barley. After the detailed tour, Kenny settles us into his office for a special tasting of Obans. We had some standard 14 yo Oban and a distiller’s version of Montilla Fino cask, after which followed the special stuff like the 20 yo and 32 yo Obans. The tastings continued further with frozen Dahlwhinnie with Chocolate mousse, Cragganmore etc. Not a bad beginning for a first time participant of Classic Malt Cruise! Neil Pendock, a wine & spirits journalist reporting for Sunday Times from Johannesburg is my cabin mate in the Chantilly for the next six days. Dave Broom, the other Malt Maniac co-sailing with me is cabined in Grampus along with Nick Morgan, Diageo’s marketing chief. We left the shores of Oban by 10 am next day morning and our experienced skipper Graham Moss (when Graham is not sailing he is either mountaineering or predicting avalanches in Europe), soon parted away from the crowd of boats and headed south via the Firth of Lorn. Our first halt for lunch was at a remote island somewhere between Colonsay and Oransay Islands. After a couple of lagers, our rubber dinghy was launched and soon we were on an exploratory tour of the Garvellachs, where the mother of St. Columba was said to have been buried. The remains of some the earliest Christian settlers from Ireland, dating back to 500-800 AD could be found here. Towards evening we anchored at the Tarbert Bank Shallows to spend a quite evening in the boat with dinner cooked by our magnificent and ever smiling cook Topi. 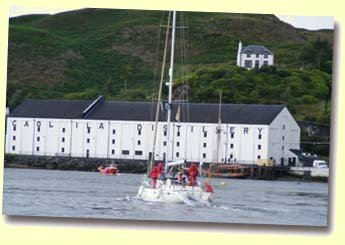 We were off, the next morning towards Port Askaig and after sailing past Bunnahbhein on the starboard side, Chantilly reached the piers of Caol Ila. 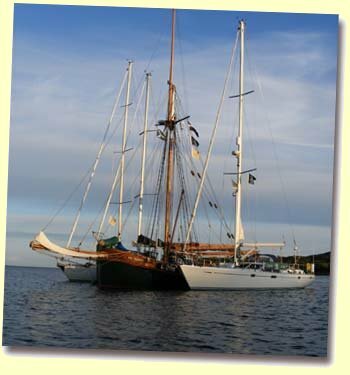 Eda Frandsen and Grampus were already anchored at the pier. The hosts from Caol Ila and other coordinators were waiting for us to take, first to Lagavulin and then to Port Ellen. Driving on the road to Lagavulin brought back fond memories of my first pilgrimage to Islay where I was baptized into whisky appreciation by my Guru – Mike Nicholson. Nowadays, in Mike’s place you find another master craftsman of Diageo – Graham Logie. As usual, the guests undergo the tour of Lagavulin followed by Lagavulin tastings. While the guests were having the special tour, I sneaked away from the crowd to have a close look of the historic “Malt Mill” in the premises. It was locked. For those who are not really aware of what “Malt Mill” is, here is a brief. In the year 1907, when Sir Peter Mackie (nicknamed restless Peter), the original owner of White Horse lost his agency with Laphroaig, he built a miniature Laphroaig in retaliation within Lagavulin distillery. It was operative from 1908 to 1963 producing some of the peatiest versions of Lagavulin during the period. The Lagavulins and White Horse blends produced during this period are legendary and are collectors items. According to Dave Broom, “If you happen to lay your hands on any of the White Horse versions of Lagavulin, just grab them. They are treasure.” When Graham had finished with his guests, I goaded him to open the “Malt Mill” and he was kind enough to oblige. The place was plain and simple and there were no hints of any distillery having once existed. I took some pictures of the old Mackie’s versions of Lagavulin and the famous White Horse bottles under the watchful eyes of Graham Logie! Visiting Malt Mill was another pilgrimage for me. The visit was followed by Port Ellen maltings tour and I have to confess that I did not enjoy it. Where once existed a distillery that produced such full bodied and finest Single Malts, you see grand scale production of malted barley that feeds almost all the distilleries on the island. I still do not know why Diageo closed Port Ellen in 1983 in preference to Caol Ila. Probably, it was more a business decision. We came back to Caol Ila by evening for the grand international tasting and I was surprised to find the national flag of India in the tasting room. Obviously Diageo did its home work very well to honour the international guests. I felt like an International celebrity for a moment. Billy Stichel whose family has been serving Caol Ila since his great grandfather’s time treated us with some of the stunning Caol Ilas during the evening. The winner of the evening was the Distillery Bottling of 2007 with 58.4% abv. We weighed anchor the next morning before the low tide had arrived, to head towards Skye, our final destination but not before halting at some of the stunning isles in the Inner Hebrides. Our next halt was at Iona during the day where we scaled the highest peak (or hill!) on the island, followed by visit to the Abbey. Iona is known more for its religious lineage. 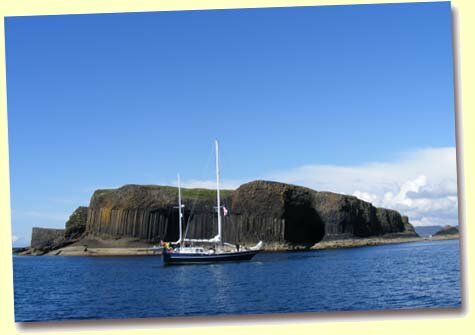 St. Columba arrived from Ireland on this island in A.D 563 along with his dozen followers to spread the Lord’s Gospel to the Northern Picts in Scotland and he was successful to a great extent. 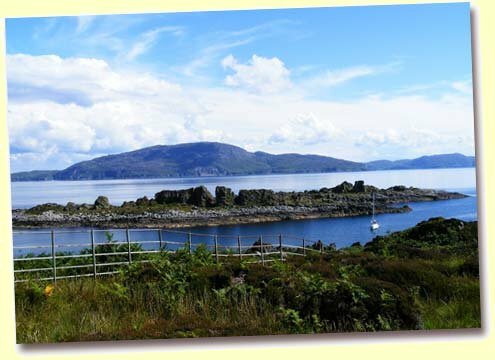 One hears a great deal about him in almost all parts of Inner Hebrides. Towards evening we moored at a remote island somewhere in Treshnish Islands to taste some of the spectacular malts of Diageo brought by Maureen Robinson, the master blender of Diageo. Dramming on these tiny isles with the sun sinking into the sea and the skies ablaze with a myriad colours is a magical experience. The setting was like a surreal Van Goch’s painting. It was an evening to remember for the rest of my life! We halted at the island of Muck which is known for its local fresh sea food and we bought some Lobster and Crabs for the dinner. We moored towards the evening at the island of Soay where we were greeted for the first time during the six day of sailing by the lazy Atlantic seals. Finally we reached Carbost at Loch Harport where Talisker is situated right on the edge of sea with the dramatic Cuillins range in the background. Charlie Smith who would be retiring in a week’s time after serving 40 years in the industry received us at the pier. After initial introductions, Georgette Crawford, the local brand home manager took us on the distillery tour. She was lamenting on the erratic weather situation for the last couple of years and said “We had to stop production during last two weeks due to lack of water,” I murmured to myself “Bloody Global warming”. The distillery has one mashtun, 6 washbacks, 2 wash stills and 3 really small spirit stills. What intrigued me most were the U-shaped lyne arms of the wash stills and the open worm tubs in the rear of the still house. Dave later on clarified that “the real complexity of Talisker is brought out in the wash stills with its unique inverted U shaped lyne arms”. Later on we gathered in Charlie’s office to taste some of the stunning Taliskers – the winner being the 30 yo, 53.9%, Bottle No. 3043 special vatting that is sold only at the distillery. In the evening during the ceilidh, Charlie was officially given a farewell and he suddenly threw the keys of the distillery to the newcomer Willie MacDougal saying, “they are of no more use to me!” Willie, as many of know has worked previously at Oban and his last stint has been at Blair Athol. The dancing and singing went late into the night and the first leg of Classic Malt Cruise 2007 came to curtains. Classic Malt Cruise is a life-changing experience and if any one has the slightest opportunity to participate never let it go at any cost. Last time I visited the Pot Still was in May 2003 when Davin and I drammed together here. I tasted my first Linkwood which turned out to be an average malt. This time too, as I had sufficient time in hand, I headed towards this historical water-hole to try something new and with obvious motto of increasing my malt mileage. It was a Friday evening and there was barely enough space even to stand. The gentlemen behind the counter were obviously impatient serving a boisterous crowd and I knew it would irk them more if I had ordered the drams from the bottles that were perched on the top of the shelves. So I asked for the bar catalogue, selected some which I thought could be in the bar man’s reach. But he came back apologetically. The gentleman declared that the stocks in the Pot Still have gone low recently and decent drams are costing more to stock nowadays. After some conversation and influencing him with my recently made Malt Maniacs visiting card, I managed him to retrieve a Convalmore, Millburn and a Royal Brackla. Now the tastings were going on with Oban with ginger, frozen Dalwhinnie with Chocolate, etc and I was fast losing interest in the stuff that was going around. I said “Come on, Kenny, why don’t you bring some special stuff like those 20 y.o and 32 y.o Obans lurking behind in the cabinet?” He had no option, brought out the bottles and poured the last remains. Score 90 points – Most enjoyable. With our National Flag behind me, I felt like a celebrity, participating in an international event. The master of ceremonies conducting the tastings was Billy Stichel whose family has been serving Caol Ila since his great grandfather’s time. There are innumerable uninhabited islands in the entire Scottish west coast and one can moor at any of these if the rocks hidden below are avoided. Or you can drop anchor nearby and reach the islands in rubber dinghies. Dramming on these tiny isles with the evening sun sinking into the sea as background, the skies ablaze with myriad of colours and a play full seal appearing now and then in the quiet waters is a magical experience. The setting was like a surreal Van Goch painting, as Maureen Robinson, Diageo’s master blender took out her special samples and placed them on the mossy rocks. Score 92 points – truly, the winner of the evening. Charlie Smith served the industry for four decades and many of the exhilarating Taliskers we enjoy today are due to his creation. I have been lucky to meet this legend at Talisker just before his retirement and consider it an honor having drammed along with him in his office. Dave Broom was sitting just opposite me. It is has been one of my long standing wishes to meet this gentleman of the whisky industry. I made it a special point to meet him at his exchange before my return to India. Finding his store at Park Royal in London was a Herculean task but it was worth all the effort. Sukhinder has a great “nose” finding interesting whiskies and he himself does not know what rare stocks he is in possession. His warehouse is not that difficult to break into and it may not be a bad idea if some maniac helps me to loot his exhilarating stuff some day!